Eco-friendly renewable materials are those that don’t involve the felling of any new, living trees, but instead, recycle potentially wasted resources into viable new products. And among the premier of such tonewood alternatives is Richlite. “Renewable” has become a way of life for guitar manufacturers that care about environmentally-conscience business practices. 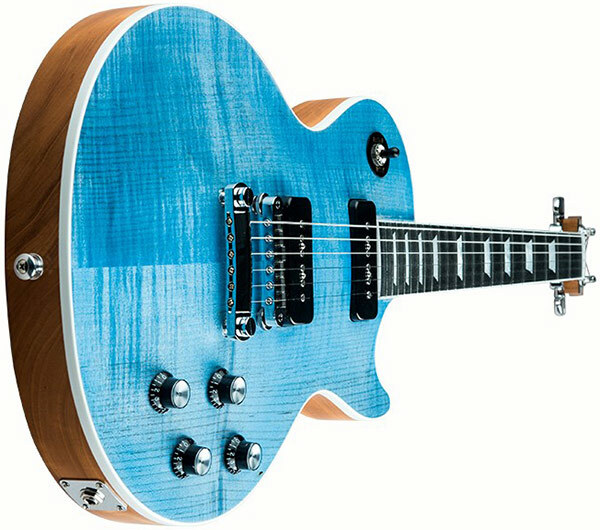 Gibson has remained on the front of these changes by creating products that maintain the integrity of the guitars while researching and developing eco-friendly alternatives. Richlite is a composite material made from recycled paper bonded into a hard, smooth, and easily workable “board.” Those are the basics, but it doesn’t tell you all of this material’s many benefits. In addition to being made from an environmentally-certified material, Richlite is non-toxic, it doesn’t shrink, it’s scratch and ding resistant, and when tooled and polished looks virtually identical to the most desirable cuts of ebony. Whether we play shred-metal or avant-garde jazz or something in between, we guitarists often like to consider ourselves a wild and adventurous bunch; yet, we can often be surprisingly traditional when it comes to our instruments. Arguably even more important than looks for many players, though, is how a material enhances the sound of any guitar it’s used in. And as much as we like for certain guitars—a Les Paul Custom or an ES-355, for example—to retain their historic appearance, we often prefer that those guitars accurately represent vintage-caliber tones, too. To that end, Gibson customers should know from the get-go that Richlite was designed to take a beating. The Richlite company was founded in 1943 and originally manufactured the product for machine tooling used by the aerospace industry. So, yeah, Richlite has held up for well more than 50 years, going on 100, and in some far more strenuous circumstances than those required of most guitar fingerboards. From industrial fixtures to counter tops to skate parks to marine components and more, this renewable product has held up extremely well under great stress. And that takes us right back to our other sustainability concern: as tied as we guitarists are to the look, feel and sound of some of the tonewoods commonly used in guitar making, it’s great to know there are renewable alternatives out there that—once we put the biases of tradition behind us—look and sound on par with the more familiar timbers. Help preserve the rainforests and continue to enjoy that gorgeous, rich, dynamic, traditional Gibson tone, too? Now that’s a win-win. But Custom isn’t the only division that’s using this renewable resource. From Gibson Memphis, you’ll find it on the Alex Lifeson Signature ES-Les Paul, the 2016 ES-355 Vintage Ebony Bigsby and ES-355 Classic White Bigsby, as well as several past incarnations of the B.B. King Signature ES-355. The craftsmen of Bozeman, MT, have also shown us how well this versatile component works in fine acoustic guitar making, as exemplified by the 018 Parlor Rosewood, a flat-top that marries traditional rosewood back and sides and innovative Richlite fingerboard to stunning effect. Whatever your taste in guitars, there’s likely a Richlite-carrying Gibson out there for you to try.